Preparing to live in a tiny house together is a big deal. Not only are you moving in together, you’re learning a new way of using your indoor space and with it, a new way of relating to each other. So here are seven conversation topics to help you and your tiny house buddy (be they a partner, sibling, friend, child, etc) prepare for living in a tiny space together. Are you both prepared to let go of it? Go through the categories of things you own and tell the other person what you want to bring with you. Decide together on what to jettison and what to bring into your tiny house. Everything counts. 2) Does the design cater to both your needs? Everything from whether to have a wardrobe, to the size of your fridge, and if you’re on or off grid, it all has an impact on how you will use the space and how comfortable you’ll be in you tiny home. Consider things like: if you’re planning on being off grid, you won’t be hooked up to a sewage line. Can you actually deal with a composting toilet or a bathroom in a different building? Be honest. Extroverts and introverts need different things from their homes and relationships. While an extrovert feels like their batteries get charged by having contact with people (eg; a great conversation) introverts need space, privacy and alone time to recharge their batteries. So think about what you need, share that with your tiny house buddy and be prepared to grant them space if that’s what they need, or perhaps you can outsource a rip-roaring good conversation for those who need it. Here’s a link to the Myers Briggs personality test if you want to dive deep. Privacy is essential in any home for sustaining good relationships and is totally possible in a tiny house, it just takes some arranging. (For specific techniques see other blog post on Privacy in a Tiny house.) Above all, trust and willingness from both parties is key to everyone getting the privacy they need. Trust that if your tiny house buddy has alone time that it will be good for your relationship. Trust that requests for privacy are a sign of a healthy relationship and not a sign of a failing relationship. Remember that in a conventionally sized house all you have to do is walk into another room and shut the door. The difference here is that there are no internal walls or doors so it might require a conversation. Having the willingness to go out of your way to grant the other person privacy is an act of love. If you’re both willing to grant the other space and time alone, you can avoid getting into any kind of resentment about sharing the space. 5) Pets – are they really welcome? 6) Friends coming to stay. What will you do when friends come to stay? Will you transform your couch into a bed or pitch a tent in the yard for your guests? And if there are people that your tiny house buddy would like to have over whom you can’t stand, now is the time to negotiate how to manage that. 7) Know each other’s ways of dealing with conflict. Do you need to retreat before you re-approach a difficult topic? Do you get hot headed before you calm down and address it calmly? Do you like to sleep on it before discussing it? Figure out your process and that of your tiny house buddy and keep it in mind for when you meet with confrontation. Fred my husband and I found that whenever friction arose, we had to clear it quickly because there was simply nowhere to hide. So we just got on to resolving things as they occurred. I’m sure there’s more. No doubt there will be a particularly important and unique conversation for each person embarking on this journey of housing liberation. Remember that once you’ve discussed it and achieved a way forward, you can proceed with confidence! Please leave comments with your strategies and stories to help others with this popular topic. And share it with friends to help them out! Thanks! 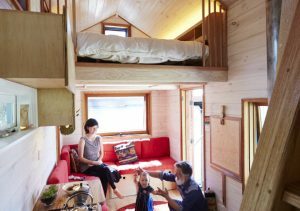 Living Together in a Tiny House – Can We Do It? by Shannon Schultz is licensed under a Creative Commons Attribution-NonCommercial 4.0 International License.